Minister for Health, Simon Harris TD, today (Monday November 5th) visited the stand-alone high-volume consultant-led cataract theatre by the University of Limerick Hospital Group in Nenagh Hospital, as part of the Government's Waiting List Action Plan. Minister Harris said “I am determined to tackle waiting lists. I sought a particular focus on reducing waiting times for a number of high-volume specialties including cataracts when developing the Waiting List Action Plan. “Actions this year include sustainable solutions such as the development of the Centre at Nenagh and the establishment of the Central Waiting List Validation Unit in the National Treatment Purchase Fund (NTPF). The Cataract Centre at Nenagh Hospital is on track to expand to full capacity in 2019 and to deliver over 2000 procedures. The centre is ideally located to enable the UL hospital group, together with the HSE and NTPF, to maximise the use of the Centre through reaching out to other hospital groups so that patients from surrounding regions can be referred to the Centre for their treatment. The establishment of the Central Waiting List Validation Unit in the NTPF will ensure good practice around the management of hospital waiting lists including twice yearly validation processes. Over the coming months, the NTPF will work with hospitals to write to patients on waiting lists to confirm they are ready, willing and available to proceed with hospital care. Budget 2019 announced that the Government had further increased investment in tackling waiting lists, with funding to the National Treatment Purchase fund (NTPF) increasing from €55 million in 2018 to €75 million in 2019. As a result, the number of patients waiting for a hospital procedure is projected to fall to below 59,000 by the end of 2019. 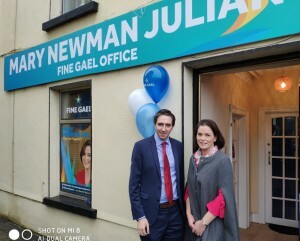 Later in the day Minister Harris officially opened the Fine Gael Office in Thurles for General Election candidate Mary Newman Julian. The busy office, located in Liberty square is a hive of activity since it opened in September. 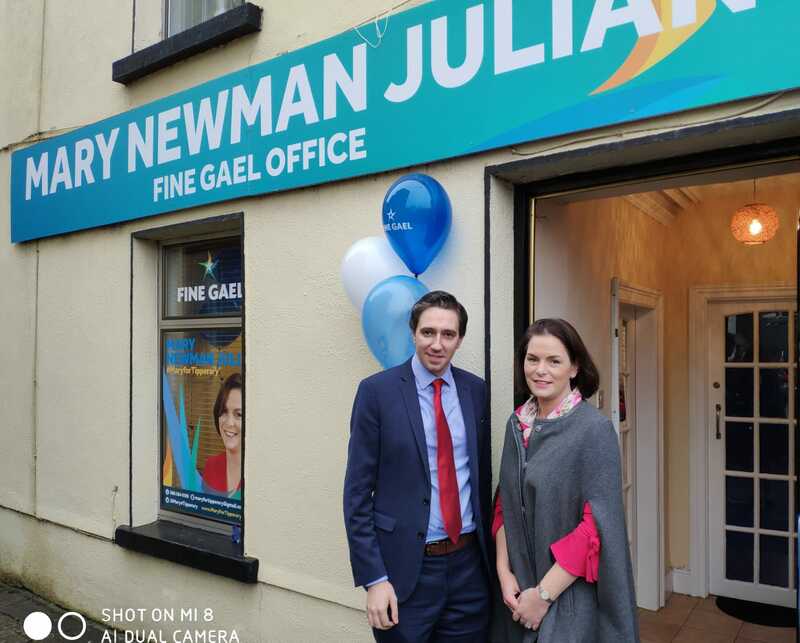 Speaking at the official opening Mary Newman Julian said ‘I am delighted that Minister Harris was able to take the time today to officially open our office in Thurles. The feedback from many people in Thurles is they are delighted to see a strong Fine Gael presence back in the town after many years. The office is centrally located in the constituency and is the nerve centre to support the clinics I hold in all the towns throughout the county on a regular basis. Many people say politics is a thankless job, but the many people I have helped since being added to the Fine Gael ticket in Tipperary are most grateful for our assistance. There have been some notable successes from our office, such as the securing of €165,000 in CLÁR funding for the Irish Wheelchair association in both Tipperary Town and Roscrea, but there are many smaller tasks that we help people with on a daily basis, as we assist people in accessing services all over the county. I am deeply committed to working for the people of Tipperary and will seek a mandate to represent them in the next general election.